The Henderson City High football squad was one of the most effective defensive teams in the nation. The explosive Flash running game racked up over 400 yards per game while allowing their opponents to a mere 5 touchdowns for the entire season. The Henderson City Flash led the state of Kentucky in both categories and also ranked in the top 10 nationwide in both categories. Bottom Row: 85-Jerry Hatley, 70-John (Butch) Shaver, 98-Delbert Estes, 75-John Wheeler, 77-Tommy Glover, 81-Carvel Moss, 66-Ronnie Moore, 87- Jim Biggs, 80-Randy Prince, 79-Tommy Cheaney, 86-Mike Schuette. 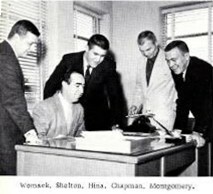 Team managers were Paul Herron III, James Adams, Steve Dickerson, Jerry Wallace and Mike Furlong. Trainers were Steve Ball and James (Snoz) Davis. 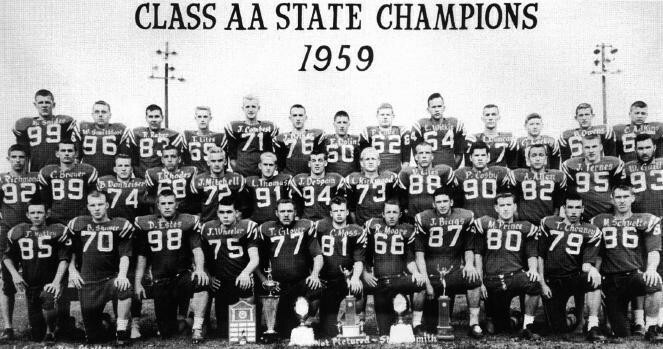 The Henderson City High School Flash led the nation in the least amount of points scored by opponents for the year 1959, giving up a very stingy 45 points. champions By Ron Jenkins published 7-28-2009. Talent? Leadership? Teamwork? Discipline? Determination? A strong work ethic? Sacrifice? commemoration of their state championship season. Henderson’s only football playoff state champion. than two minutes remaining in the game. Tommy Rhoads hit him with a crushing tackle at the ten that split Rhoads’ helmet — and jarred the football loose. pounced on the ball at the two. visit from Kentucky’s governor, Corydon-born A.B. “Happy” Chandler. outscore the opposition 407-45 and post seven shutouts. fittingly, captain of The Courier-Journal’s All-State team. all while doing double duty as a linebacker. the Henderson County Sports Hall of Fame. “He was our leader— on and off the field. He was determined to win. All-Conference career at Murray State. apparent that he meant for the players to enjoy the sport, to have fun. great time while achieving greatness on the field of sport.